If you are unhappy with the appearance of your smile, ask your dentist serving St. Louis if dental veneers could help you get the smile you’ve always wanted. Veneers offer a long-term solution for many cosmetic dental woes. They’re long lasting and require very little special care. Are veneers the right choice for you? Here’s what you need to know. Dental veneers are thin shells that are attached to the surfaces of your teeth. You can have veneers attached to as few or as many teeth as you like. Veneers can be made of porcelain or resin, and because they are custom-made for you, they have a completely natural appearance. Veneers do not require any special care and last between five and 10 years before replacement is necessary. To place veneers, your dentist will start by prepping the teeth that are being treated. 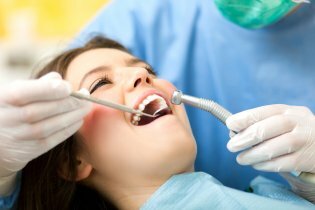 It may be necessary to remove a small amount of tooth enamel to make room for the veneers. 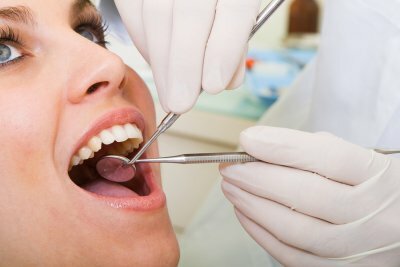 After making an impression of your mouth and having your veneers created, your dentist will etch the surfaces of your teeth to allow for better bonding, and then put the veneers in place. Before the veneers are cemented, your dentist may make several adjustments to their shape and color to achieve the results you desire. Veneers are a great option if you have teeth that are chipped, worn, misshapen, or severely discolored. Unlike dental crowns, they don’t require the removal of a large amount of natural tooth, and they look very natural. If you plan to have your teeth whitened, be sure to do it before you get your veneers, as you can’t alter the color of your veneers once they are in place. If you want a more durable, effective solution for changing the color of your teeth than standard whitening, talk to your dentist serving St. Louis about veneers. 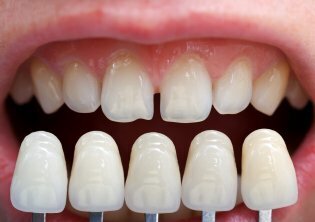 Veneers can permanently change the shade of your teeth, while also improving their shape and size. Watch this video to learn more. Veneers are thin, porcelain shells that are attached to the teeth. In the past, veneers required the removal of some of the surface of your teeth, but today’s veneers are so strong that little to no enamel removal is required. This means you can get the transformative power of veneers without compromising any of your natural tooth structure, which is a win for the appearance of your smile as well as your long-term dental health.